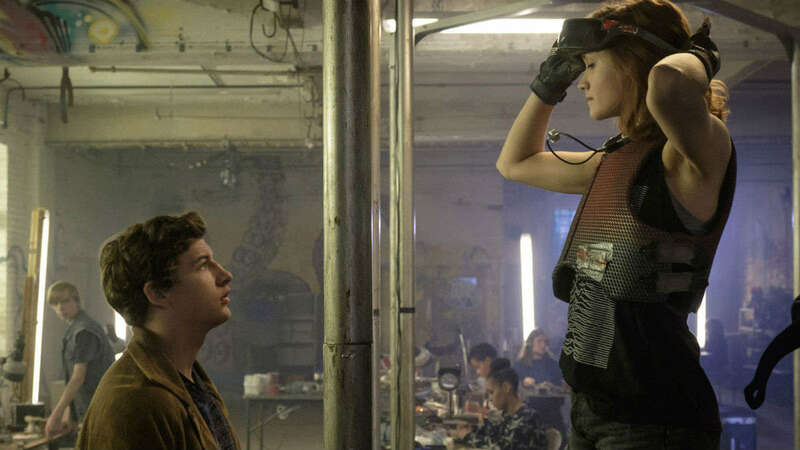 And yet, because of its affinity for nostalgia, Steven Spielberg’s adaptation of Ready Player One feels like a bells-and-whistles show that uses a densely populated world of references as a cover for a story that has no legs. This story is, at its core, a basic one. It is your classic good versus evil scheme with no room for a gray area. And the film throws in your standardized Hollywood romantic B-plot for good measure. Without the science fiction world as the film’s setting, the plot would reek of a lazy conventionality. Therefore, it is the story world—or, rather, the world within the story world—that fuels whatever creative juices the film has at its disposal. Enter The Oasis: a gaudy trap of endless pop culture iconography and video game graphics. Whatever character model is not an established IP just looks like a generic design for a video game NPC. This includes all of our main characters. If you’re in it merely for the references, then you won’t be disappointed. Then again, much of the visual references are blink-and-you’ll-miss it. And most of the allusions that aren’t are given blatant ADR lines of dialogue that exclaim the presence of a reference. This presents a throughline problem for Ready Player One. There is enough creativity with the references on their own to merit the existence of them. There is one sequence involving a famous movie setting that works quite well, for example. But the script continuously reminds us that we are watching an entirely artificial cinematic experience. Every piece of information that the script presents us is signposted with utter clarity. While most of the plotting is already conventional, and thus easy to predict in many cases, it still lessens scenes considerably when the characters robotically explain what is happening or what happened in the past to lead us to this moment. This problem even ruins a less predictable reveal near the end of the film—one instance where I personally didn’t think to put two and two together, at least. The revelation comes with a cheeky callback to a previous action, which on its own would be a perfect way to execute the moment. The scene, however, goes on to overly telegraph and further explicate the moment. This kind of poor scripting hampers Ready Player One. For a lengthy film, the excessive dialogue that prods at backstory and circles back on points just to make sure the entire audience is still on the same page (we are) only makes it feel longer. While certain set pieces and extravagant displays of visual effect work occasionally break through the video game cutscene quality that pervades the rest of the film, there isn’t enough of substance in any of the plotting or characters to drive the film home. Olivia Cooke’s performance props up her bland character a bit, but none of the other actors are doing their boilerplate characters any favors. Ultimately, Ready Player One is an average science fiction adventure story that is overstuffed and relies on nods to better films and video games to catch its audience’s attention. It shoves hundreds of allusions in your face too quickly and bluntly to allow enjoyment of them. It beats you over the head with exposition despite a plot that couldn’t be more conventional. Its characters are just as hollow and superficial as the avatars they inhabit. Without Spielberg on board to create sequences that glimmer like diamonds in this messy virtual rough, the film would be an utter disaster. But his control on the joystick doesn’t maneuver the film out of harms way, either.